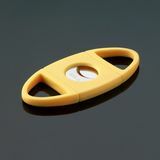 There are many types of cigar cutter available to match your cigar. There are many types of cigar cutter available to match your cigar, including acrylic, stainless, finger and scissor cutters. Siglo is a quality brand in cigar accessories and well respected in the cigar-smoking fraternity.